We wish the company well —but while there's any chance it's in trouble, we at least want a backup of our information, and we want it accessible in one of the firm's rivals. There's much more to backing up than copying notes, though, so AppleInsider shows you how to be certain you save everything. It seems as if the Evernote company has always been in trouble but this month we've learned that it's shed several key people. That includes its Chief Technology Officer, Anirban Kundu and its Chief Financial Officer Vincent Toolan. Given that this is a software company that is also trying to raise investment money, these are two crucial roles to be vacated. Hopefully the company will be fine and in which case regard the following as sensible advice for just backing up your data. If the firm ever isn't okay, though, then you may need to get your notes out of Evernote and potentially in a hurry. Officially that's easy. 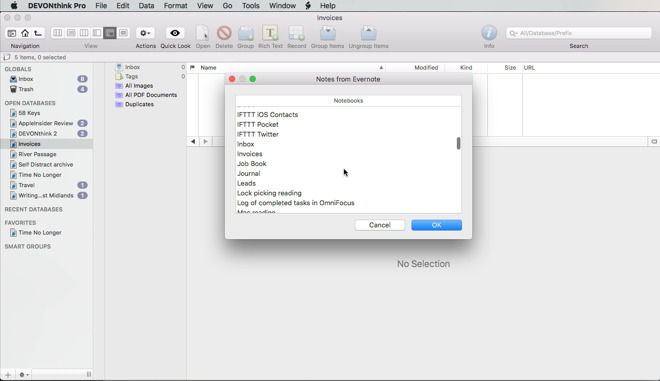 Evernote has long made it simple to export your notes. Only, there are devils in many different details and to get all of the data both out of Evernote and into somewhere else that you can actually use it is a bigger task than the company suggests. Two things. You're going to have to do this on a Mac. The iOS version of Evernote is not able to export notes en masse, Nor is the online version at evernote.com. Also, you're going to need somewhere to put all these notes. We'll show you how to move all of your notes to Apple Notes, Bear and DEVONthink and only partly because all three are excellent. There's also the fact that between them they demonstrate the different ways you can expect to import Evernote data into any app. The odds are that the great majority of your notes in Evernote are short pieces of text. Draft letters. Shopping lists. Notes you made when someone phoned. In theory, all of these can immediately go over to any other note taking app. Don't do this yet, but the idea is that you can open Evernote on your Mac, then click on All Notes toward the bottom of the left-hand navigation column. Then click in a blank space in the All Notes column that appears. Choose Select All from the Edit menu or press Command-A on your keyboard. If you do this then Evernote tells you how many notes you've got and offers several options in a series of buttons such as Save Attachments or Move Notes To. Ignore it all. Instead, go to File and choose Export Notes. This takes you to a regular Save dialog and you need to pick somewhere on your Mac that you can export all the notes to. They will be saved as a single file, you're not going to suddenly find —in our case —7,068 individual note documents filling up our desktop. Actually, you're not going to suddenly find anything: this is a slow job. That's one reason we're saying you shouldn't do this yet, but when you do, you end up with a single file in Evernote's .enex format. Then according to all Evernote's support documentation, you just import that file into your notes app of choice and you're done. Doing it in this official way is very slow and that .enex format has some serious omissions. Evernote lets you create notes that you put into a notebook, for instance, and you can then have a stack that contains notebooks. None of that organization survives the export. So you may end up with just one Evernote .enex file but within it is every note and no notebook or stack. That means the slowness of exporting it all may be equalled by the slowness of importing that lot into another app —and both will be dwarfed by the time it takes you sort out the mess. For that reason, and more, do your export from Evernote piecemeal. Rather than clicking on All Notes, choose Notebooks instead. You get a list of all your notebooks with title, number of notes and the date you last created or modified a note in there. Right click anywhere on that line and choose Export Notes from. The first one we did, for instance, was our folder called Invoices so the right-click menu item was Export Notes from "Invoices." 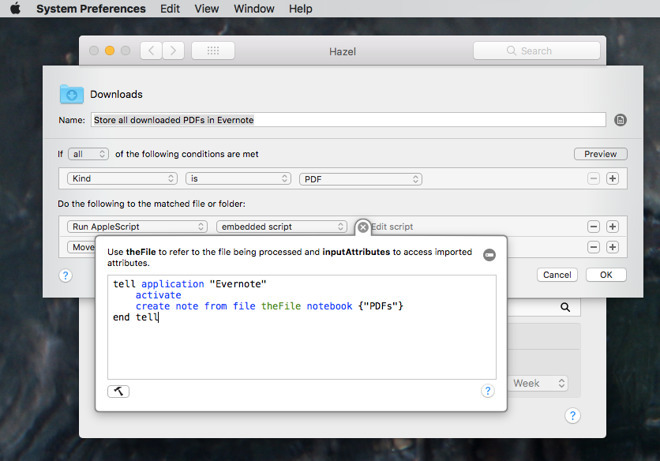 Then do the saving of the .enex format file to somewhere on your Mac. This is probably going to be quite quick as any one notebook is only going to contain a fraction of the notes you have in total. However, while it's exporting, open up your alternative app and create a folder in there with the same name as the notebook. Apple Notes has perhaps the simplest approach: you choose File, Import to Notes and then just point the app at your saved .enex file. Yet again, though, the practice is different to the theory. We would like to be able to click on our new Invoices folder and have Apple Notes import the Evernote data into there. It even looks as if that's what is going to happen, but it isn't. Instead, once you've chosen the .enex file, Apple Notes creates a folder called Imported Notes and brings everything into that. You don't have a choice about this but you do have a choice about then ending up with Imported Notes 1, Imported Notes 2 and so on. Let it it finish importing your notebook into this folder, then Select All and drag everything to where you want it to be. In our case, we dragged from Imported Notes to Invoices. And then we deleted the empty Imported Notes folder. Next you move on to another Evernote notebook and go through the same process. Bear Notes does things differently. 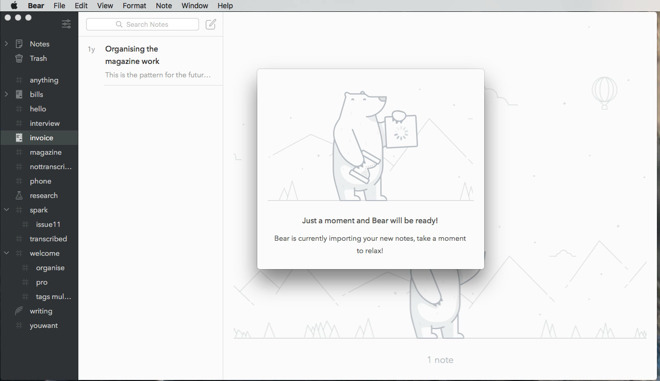 In Bear, you choose File, Import Notes, but this time you get many more options. Some are important, too. The first is a tick box saying Bear should keep the original creation and modification date of the notes. Give us a reason, any reason, why you'd want your 7,068 notes to all be changed to today's date instead. Apple Notes takes it for granted that you want to keep the original datestamp but you have to be sure Bear has this option ticked. Also, make sure you tick an option called Escape involuntary tags. Bear works on tagging, that's how its entire structure is formed, and a tag is anything you write that has a # symbol in front of it. So if you happen to work in social media and have accrued notes about yours and other people's campaigns, Bear would take every single hash symbol as meaning you want to create a new tag. The tagging also means that you can't import into a folder in Bear —because there aren't any. Instead there are collections of tags. 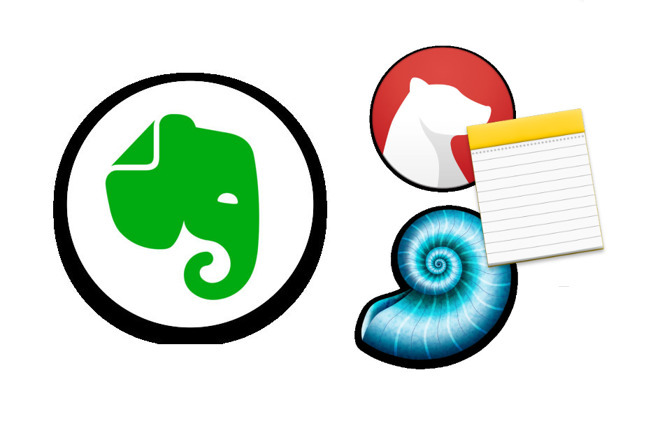 So you could import all your Evernote notes and then schlep through them adding Bear tags. This all sounds like a long job and yet we found Bear was fast at importing notes and it felt that we could very soon get on with organizing all of them. So far we've been using the Evernote .enex format file and it's good to have that as it's one document you can also store away on a backup. There is one notes app that doesn't need it, though, and that's DEVONthink. It's practically insulting to call DEVONthink a notes app as it's really a way of researching and storing masses of information. It is more than capable of handling all that Evernote does, though, so it's a good option for moving data en masse. Especially as in this case DEVONthink effectively plucks the data straight out of Evernote. 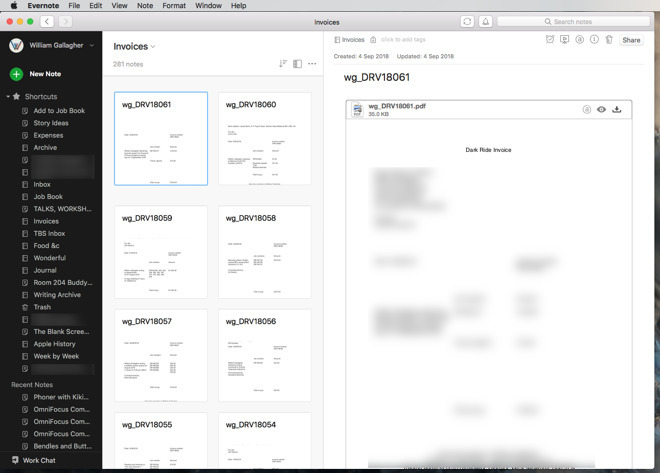 In DEVONthink Personal or Pro for Mac, you can go to File, Import and then choose Import from Evernote. 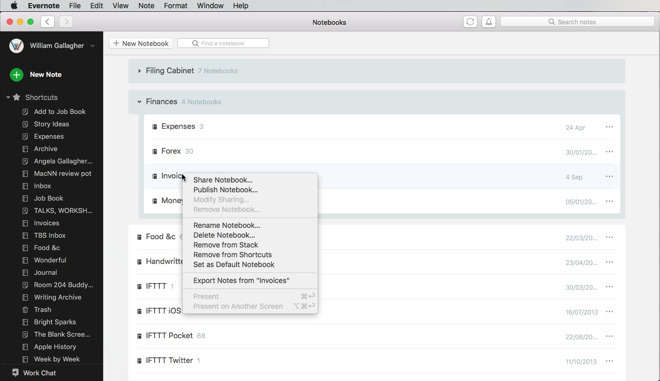 After a moment, DEVONthink displays a list of all the notebooks in your Evernote. Click on one, shift or option-click to choose many —or press Command-A to select the lot. This time you can afford to that because when you click on OK, DEVONthink imports everything and arranges it all into folders that match your Evernote structure. That's tremendous and we practically applauded when we saw what DEVONthink does with Evernote notes that have audio recordings in. It creates a new folder with the name of the note and within it there's a document with the text plus each audio recording separately saved and playable. Bear seemed the fastest to us and DEVONthink was easily the best —but only Apple Notes warned us of an issue. Before choosing to import from the .enex file, it warned that what we bring in "may look different in Notes". 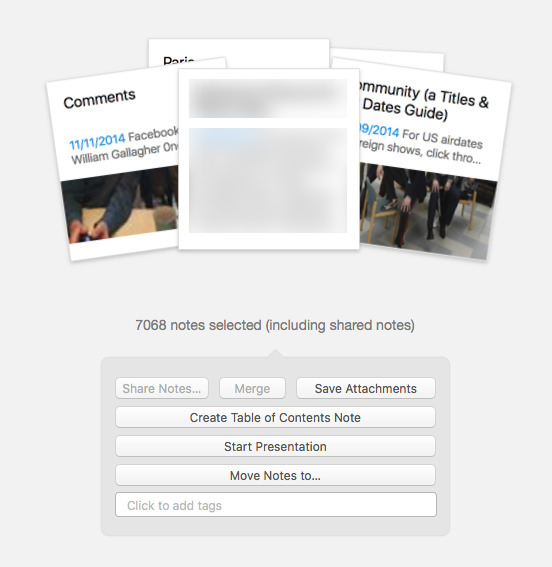 No matter what app you move your Evernote notes to and no matter how many thousands of notes you've got, check them. If we ever lose access to Evernote for any reason, you might still have the .enex file but won't have any way to recreate the structure of the notebooks. You will end up with notes you aren't sure where to save them now or find them later. Plus, this is probably going to be your sole copy of all this data and it's important. Back when Apple Notes first became the Evernote competitor it now is, we found that the import could mangle some notes. We haven't seen this since and don't want to tarnish Apple Notes with a long-fixed issue, but we'd see the title of the note and assume it was imported correctly. Then only when we came to read it would we find that it was an unreadable string of data. Again, we haven't seen this in some years and we didn't see it a lot even then. However your notes data is so important that you can't risk it. This is the other reason we say to do the move notebook by notebook. Take your time, do it over some weeks, and skim through every note as you go. If you do all of this then every note you've ever created in Evernote is now safely in Apple Notes, Bear, DEVONthink or anywhere else you wanted. However, Evernote isn't just somewhere you'd go to jot things down. It is a comprehensive tool for amassing information and you may very well have workflows or systems on your Mac that use it without you. 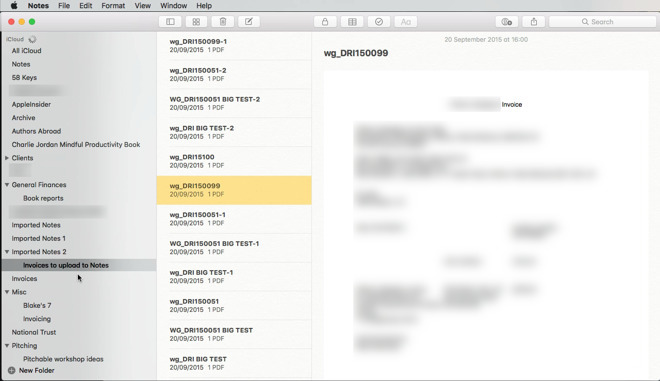 For instance, every time we download a PDF on our Mac, a copy is saved into a PDF notebook in Evernote. That's done by the utility Hazel and you can have similar things happen via Drafts actions, IFTTT steps or Workflow/Siri Shortcuts. If these are as embedded in your Mac as ours are, you're only going to notice them when something goes wrong. Should Evernote disappear off our Macs then Hazel would display an error notification, for instance. That's not so immediately likely with the online tool IFTTT which might or might email you a warning depending on how you've set it up. So as you're watching Evernote export each notebook one by one, take the time to think through your work and how you may be using Evernote in unexpected ways. Nobody said it would be quick. Well, maybe Evernote's support documentation implied that it would. When there are so many notes and the data in them is irreplaceable, you need to take your time. Apple Notes is free and already on your Mac. Bear is also free but to synchronise notes across Mac and iOS devices you need a subscription of $1.49 per month or $14.99 per year. DEVONthink comes in several versions with a basic one costing $49.99 in the Mac App Store. However, makers DEVONtechnologies have pointed out to us that the Mac App Store edition is not the same as the one available direct from the official site. Specifically, it does not include the Evernote importer.